Toyota continues its “Let’s Go Places” campaign with a new spot for the 2020 Corolla, featuring famed beat boxer KRNFX. The 30-second spot follows the artist as he drives the new sedan to a club where he puts on a show unlike any other. On his way, he “practices” a little bit. In another ad, the champion beatboxer shows that he can take his talents even further thanks to the first-ever Corolla Hybrid. The automaker has also enlisted dance duo BhangraFunk to star in a commercial for the 2020 Corolla. Chaya Kumar and Shivani Bhagwan, the creators and founders of BhangraFunk and BollyFunk, who have become a worldwide phenomenon thanks to their viral YouTube dance videos, are seen driving through the city a 2020 Corolla and joining a group of locals on a rooftop for a dance battle. Other recent spots focus on specific features of the “Greater Than Ever Corolla,” such as the bold new grille, the standard pre-collision system, and more. One of the spot also features natural hair model and influencer Jihan West as she takes a trip to the salon in the all-new Corolla, not for styling it, but for donating hair to kids. 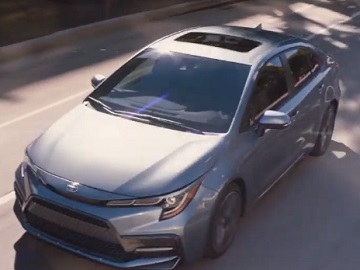 Unveiled in November 2018, the 2020 Corolla is the 4-door version of their recently launched 5-door hatchback. With a track width up by 0.5 and 0.9 inches at the front and rear with respect to its predecessor, the new sedan features a multi-link rear suspension that replaces the torsion beam. Corolla SE and XSE trims boast a new 169-horsepower 2.0-liter inline-four-cylinder engine. All other Corolla trims carry on with a revised version of the 1.8-liter inline-four that lives under the hood of the present-day Corolla LE Eco. Every Corolla comes standard with active safety features such as lane-departure warning, lane-keeping assist, a pre-collision warning system with automatic front braking, and automatic high-beam headlights. The cabin has a 4.2-inch gauge cluster display and a touchscreen infotainment system that are also standard across the board, with Toyota’s latest Entune multimedia system, which includes Apple CarPlay compatibility and a built-in WiFi hotspot. High-level XSE and XLE trims come with an in-dash navigation system and JBL premium audio system.